Believe it or not, up until 3 weeks ago I'd never actually eaten a cherry... yes, as in the plump red Bing variety. I know, I know. On our way out of Portland Gabriel and I said goodbye to the Beaverton Farmers Market, walking past a beautiful display of fresh picked fruit, when the vendor held out a handful of fresh cherries to sample. Up until the moment when this generous vendor offered me a tart ripe cherry, my experiences with cherries included the bulk bottled maraschino cherries that my brother could not eat ice cream without, and... well... cherry flavored starburst. Even when last summer friends of ours traveled home to Washington and brought us back a magnificent helping of healthy blushing cherries, I passed, offering every single one of them to Gabriel. Figuring that I was a big girl now, and it was time to get over my ridiculous and unfounded aversion to cherries, I followed suit and accepted the sample. It took only the moment when my fingers touched the smooth glossy flesh to fully convert me, and then I took the first tentative bite. As unexpected juice dribbled down my chin and I sought to capture it with my tongue, not out of embarrassment but because I didn't dare lose any bit of that luscious fruit, I lamented all those wasted years feasting simply on red raspberries and strawberries, lonely without their sister cherry. Like last summer, this year we were again offered a healthy bag of blushing cherries from my sister Pamela, but this time I offered Gabriel only half of them. Together we've enjoyed this week consuming them whole, in cherry/honeydew melon smoothies, dipped in chocolate, and as a medley combined with blueberries, raspberries, and strawberries in delicious cherry dessert my sister treated us with. So... you guessed it! This month's recipe swap is all about cherries! Had I enough cherries to devote to a pie, I would have made this one! Plus, Celeste recently took a trip to Europe and posted about her incredible adventure, so take a peek! 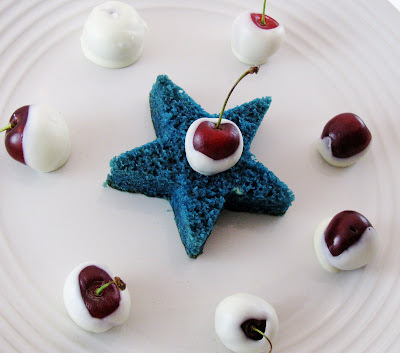 Of course Helen continues to inspire me, er make me drool, and her latest cherry concoction is no exception! These bars couldn't be more decadent, mouth watering, delicious, or wonderful! These little cakes are so simple, so festive, and very adorable. Now, it is your turn! 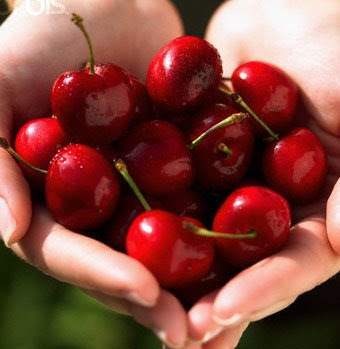 Share your favorite cherry recipes for the month of July, and be sure to include a link! I will pick a recipe at random(.org), and highlight it on my blog! I love to make new recipes, and I love to link to fabulous, talented people! That is a great idea! 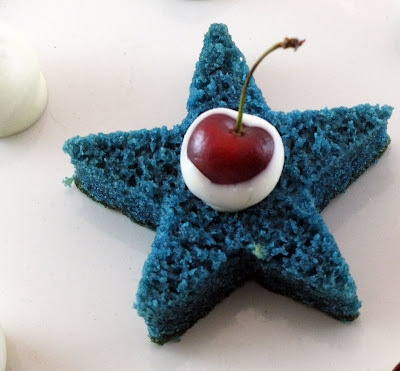 My boys would love blue cake. I have never tried chocolate dipped cherries!! I think you are on to something. OOOH goodness! i loved your description of cherries! MMM they ARE DIVINE! too bad in oklahoma we don't have fresh fruit, really! i can't wait to come to montana and utah to get some! yay! and secondly... I LOVE YOU! and can't wait to see you!!!! yay! you are the best! MAN! you are soo creative! This is a delicious looking eat. What a great idea! We had beautiful fireworks in our area. Hope you had a happy 4th!